I wouldn't trick or treat at your priests' house wearing this! 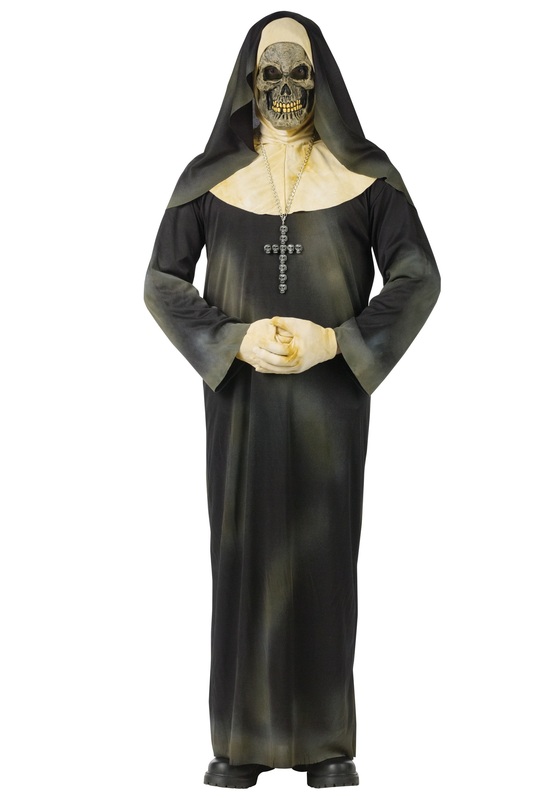 This Sinister Sister costume comes with a one size fits all black robe that fits easily over the head. There are a couple faint gray streaks on the robe to make it look worn and old. The 2 piece habit fits easily on the head. The habit is flesh colored and only exposes the face. The veil of the habit is black to match the robe. The skeleton mask fits easily over the habit with an elastic band. The skeletal face is a tan color. It has yellow teeth with red stains, black mesh eyes, and a black triangular nose. The included gloves are also flesh colored to match the neck of the habit. The cross necklace is made up of skulls and hangs on a silver chain. This costume can be a part of an evil group of nuns when you and your friends go out for Halloween!